Cypak, a Swedish technology startup, has created secure contactless technology that can compete with traditional RFID systems. 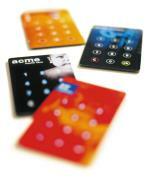 The company uses conductive ink and adhesives to print electronic circuits and antennas on paper and plastic. Although the current versions of the product are only capable of transmission over short distances, the technology is flexible enough to allow a much longer read range. So, if you had a stylus that was able to make marks that the paper computer understood - you could transmit your message, just like Herbert remarks in his book. See more details at RFID Journal - Smart Packaging, Smarter Cards and Pocket-sized Computer.